May 15th, the day billed as the finals � or the most difficult day of the whole trek, but from a seasoned trekker of our group, who is here for the fourth consecutive time had long back dismissed the suggestion of this being finals and opined that trek up the Kedarkantha peak and descent thereafter was the real finals. The day's trek was going to be difficult and longest so far � 11 KM to Talhauti and so we started at 7.00 AM in north east direction. Initially after crossing patches of snow and ice we found ourselves moving along the crest on the mountain ridge at a height of about 11000ft and it is where BSNL network is detected and this gives a reason for longish break when people try to contact their homes. 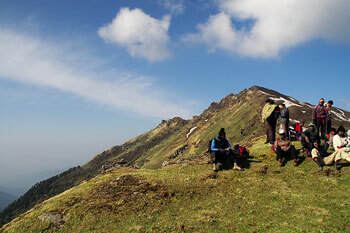 Trek along the ridge is difficult and the view on the right some times scares you with those dangerously cut terrains. People took lot of photographs in those areas. The terrain once again changes and you find yourself walking up and down at an altitude of 11500 ft, on slopes covered with snow and ice. These slopes are inclined at 45 to 75 degrees. 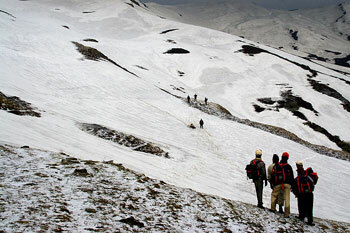 It is nice experience to walk on snow clad slopes. 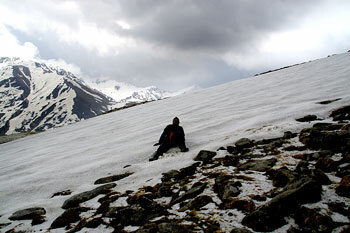 It is an experience, so different form what we had in walking down the snow clad ridge at Kedarkantha. 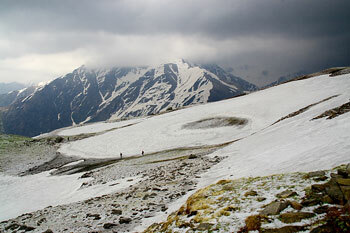 By this time of the trek, people feel much more confident but these slopes can still test our mental toughness. Lunch point in on a small rock on the slope of a snow clad mountain. Much to the relief of the trekkers there was tea at this point. Till this point from Dhundha, YHAI arranges two guides and from this point onwards there were three guides accompanying us to Talhauti. This shows the degree of difficulty that YHAI sees in this stretch of the trek. At this point you are tied with a belt with cabanier which will be used ahead in the trek. The way ahead is only on snow. YHAI claims that this stretch is 3 KM long but participants felt that its is much longer. Whatever be the truth you will enjoy this stretch and something that you will cherish for a long time to come � walking on the left side slopes on ice and for a stretch of half a kilometer or so with cabanier hooked to a rope. At the end of these narrow and inclined pathways you will find yourself on snow clad plane areas and as you cross them and over a small climb you can see the Talhauti campsite at a distance and people are so desperate to reach them after the tiring and draining effort that they had put in all day that there is every possibility of missing a wonderful sight of series of fully snow clad mountains very close by on your right. You can run down and go up these hills and relax on their lower slopes if you have any more stamina left. You cannot imagine a better reward for the efforts put in by you for the day. What can come in your way, is your lack of stamina and continuous hails. The camp leader at Talhauti Mr. Misra working in SBI and a conqueror of Mount Everest in 2007 at the age of 52 extended a warm welcome to all of us. We reached the camp at about 3.00 PM. This by far was the fastest time registered by any group at Talhauti till then. In fact our group had maintained this record at every campsite. 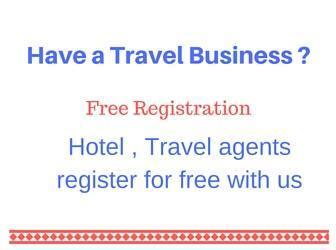 One reason could be that ours was an �all males� group � christened �Bajrang Dal� by Mr Chauhan at base camp. Also the weather might have relented a bit after the first week of May. 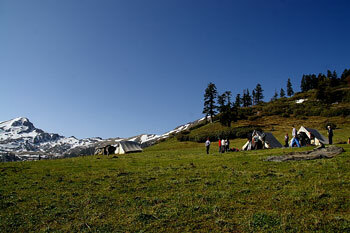 We were told that the first group to Talhauti on 8th of May reached the camp at 10 PM. Evening was spent ensuring shoes and clothes dry up fast in the tent � once again courtesy Kerala team mates who put the wire in place quickly. Hospitality of the cooks was at its best here and the hot gulab jamuns served along with dinner was the highlight. May 16th, the day that marked the beginning of return journey in our trek started in a relaxed manner and we started at about 8.30AM after some tips by the camp leader on dos and donts of climbing down the hills, as we were to go down to about 7000 ft.